The funeral of football manager Keith Alexander has taken place at Lincoln Cathedral with hundreds of people paying their respects. The Macclesfield manager, who was born in Nottingham, died two weeks ago at the age of 53. 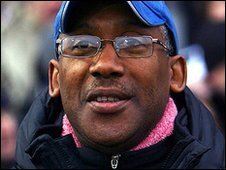 He became the first full-time black boss in the Football League when he was named Lincoln manager in 1993. Alexander died on 3 March after arriving home from the League Two match at Notts County. Players, staff, directors and supporters from across the East Midlands travelled to Lincoln to pay their respects. Macclesfield assistant manager Gary Simpson paid tribute to Alexander saying: "He was a larger than life character - an honest man, a splendid man and will be missed by not only football people but people in all walks of life. Notts County youth team coach Michael Johnson said Alexander was a role model to all aspiring black managers. Mr Alexander's son, Paul, said his father was a caring man. He said: "He would give everything and ask for nothing in return. "We not only had a father and son relationship, we were like best friends. "He was humble, he didn't realise the impact he had on others just by walking in to a room." After spells with Ilkeston and Northwich, he returned to Sincil Bank in 2002 with the club in administration and on the verge of folding. He led them to four successive League Two play-off campaigns - the only manager to achieve that feat.